June 2012 - Take a day trip! The (Summer) heat is on! Bigelow Hollow State Park in Northeastern/Central CT. This is one of my favorite freshwater spots if I’ve got a day where I want to dive right in. It’s right off I-84 and maybe 1.5 hours from Boston and less from Providence and Worcester. The state park website is OK and does give decent directions. It’s a great place for a grill as well since they have pits for that and picnic tables. Houghton’s Pond: This pond is just barely outside Boston and right off I-93/Route 128 (exit 3; marked Hougton’s Pond). For sheer convenience it can’t be beat and there’s a snack bar there too. I’m hoping to have more information added to my Blue Hills Reservation Page. In the interim, check out the official park page. Misquamicut Beach: This Rhode Island beach is also a future addition to this website, they’re known for their great waves even if the parking fees for out of state plates were recently raised to levels that should be considered extortion! Sadly the link to the RI State Park website appears to be dead at the moment but it’s basically one of the last exits off I-95 in Rhode Island before you cross the line into Connecticut. Duxbury Beach: This beach on the South Shore is a little on the cold side however it’s a great beach without the hassle of the Sagamore Bridge that can really make a trip to Cape Cod a chore. Here’s a link for more information. Crane Beach: This Trustees of Reservations property on the north shore is a real gem and, even with ‘brisk’ water, is a nice place to spend the day. Check out the Trustees site for more information. These are just a few of many great places all within a couple hours of Boston (except Misquamicut, that might be a little bit longer) that provide a great place to cool off on a hot day. If you’re lucky enough to NOT be in an office for the next few days hop into your car and make the trip, you’ll be glad you did! Boston is an amazing city with more great places to check out than I can certainly remember and list at once. From the lovely banks of the Charles River through the Esplanade to the awesome courtyard of the Copley Square Main Branch of the Boston Public Library and the Museum of Fine Arts, there is no lack of great places to see. I hope to check them all out for you eventually, however I had to start somewhere in the city. That somewhere is a gem of a park in West Roxbury, Millennium Park. Originally a dump until it was capped with dirt from Boston’s (in)famous Big Dig project, it has something for everyone now! From soccer fields to a canoe launch, it’s a great urban park that everyone can enjoy especially with most of it being handicap accessible. If you’re looking for a nice place to spend in afternoon on the southern edge of Boston this place is definitely worth a look! Wear long pants when hiking in the woods. Don’t make it any easier for ticks to get to your skin than necessary. They further recommend wearing lighter colored pants so it’s easier to spot dark colored ticks. Tuck the bottom of those pants into your socks so that there isn’t a direct access to your skin. Wear and use a good bug spray that has DEET in it. I carry a can in my car and in my hiking backpack whenever I go out. I didn’t use it yesterday and had to remove a ton of ticks, plus it has the added bonus of keeping mosquitoes away too!! Try to stay in the middle of a trail. Ticks need to find a way to land on you and that is usually accomplished by brushing by a plant on the trail. If you aren’t brushing by plants all the time then they’re a lot less likely to land on you. Check yourself for ticks after hiking, taking care to look for the rash that goes with a tick bite and also to check unexposed areas that are easier for a tick to hide in like your armpits, between your toes, behind your ears and other spots. If you find a tick use a pair or tweezers or something similiar and grab it as close to the head as possible to pull it out. If you’re worred about getting Lyme disease then save the tick and your state probably has a lab that can test for Lyme disease (I know Massachusetts does). From what I’ve read if you catch the tick within 24 hours of it landing on you then your chances of getting Lyme Diseases are really, really low and you probably don’t need to worry. If you want more information I’d recommend taking a look at the Massachusetts Department of Health’s tick website. I strongly recommend making the time to get outside and hike but it seems like there are a lot more ticks this year so take some time during and after your hike to check for these miserable little creatures!! Take a day on the Cape without the Cape Drive!! 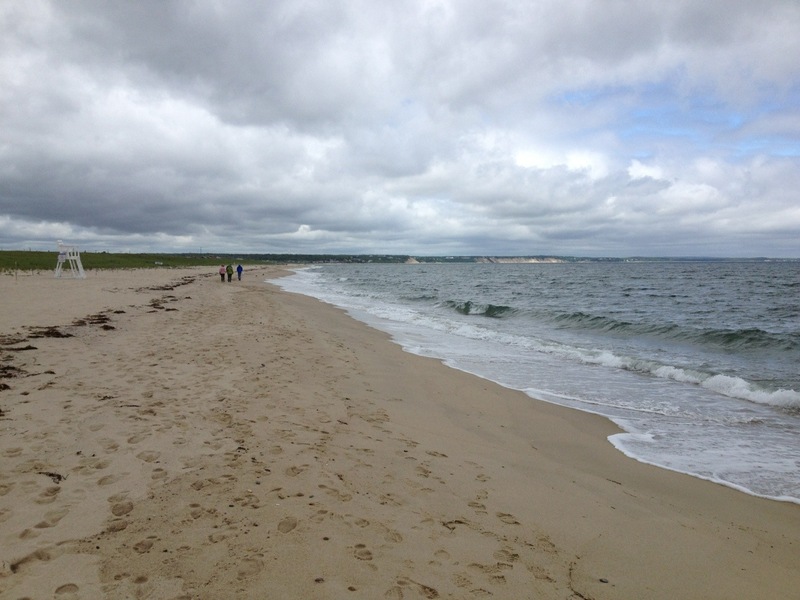 I had the pleasure of visiting Scusset Beach State Reservation last Sunday. Scusset Beach has many of the rewards of visiting the Cape without having to deal with the bridge traffic, especially trying to head home on a warm Sunday afternoon in the summer. It’s especially nice that there’s also access to the Cape Cod Canal Rail Trail and it’s easily less than a tank of gas to get there. Combined with the snack bar, other facilities and the great restaurants right down the road and you have a great place to spend a hot day in the summer!! If you’re riding a bike making it to the other end of the trail also means that there’s Del’s Iced Lemonade (a person favorite taste of Rhode Island) or ice cream too! Check out my page with more information and enjoy the video of an empty beach in June (a rarity thanks to the less than stellar weather we had last weekend)..
Making the best of life in a bad economy. I was out enjoying a delightful sunny afternoon today while taking my lunch break at work and had a thought about adding a little more to the reasons why I’m working to get this site off the ground. I was walking out from my haircut and there was a gentleman being removed from the parking lot in an ambulance after the police came because he was causing a ruckus and interrupting people. Apparently there was a lot of swearing and anger in general. It’s a theme that I’ve seen a lot of lately. Regardless of why you might think things are tough out there, they most certainly are. Unemployment is up over 8% (honestly probably nearer to 10 if you counted it correctly), the economy might be headed back into a recession (or we may have never escaped the last one), wages are flat and people are worried out there. Stuff’s getting more expensive and paychecks aren’t keeping up and people have had to cut back on all sorts of things considered frivolous that are often a key part of one’s well being. Often it’s the vacation budget and time that’s the first to go when people are making cuts to survive. Of a lot of people feel that they need to be constantly available because of the fear of losing their job since there are so many people out there eager and ready to jump right in. I see people who are stressed out, overworked, under appreciated and a lot closer to the breaking point than ever before. In a environment like that I think it’s even more important then ever to plan a getaway, no matter how small. Luckily, we’re blessed to live in an area with TONS of great places to see and things to enjoy. Within two hours of Boston there are wonderful beaches, lovely mountains and tons of amazing places in between. The amount of trips that you can do on one gas tank is pretty impressive! If you can add a day to two together to get a little further away that list grows even more. Making a little time to step back, decompress and unwind is more important now than ever. Whether that is some time with your toes in the sank at a lovely beach, sitting at the top of a mountain enjoying the panoramic view or doing something else you need to set aside the time for it. Having that stress release and sense of escape is so important when times are tough. Even if it’s only a few hours, make the time to get outside and enjoy out little corner of the world. From Scusset Beach to Mt. Sunapee and everything in between there are lots of great places nearby that are a very cheap and close trip. I had the pleasure of spending some time last weekend on Rockport, MA. Rockport is a lovely seaside town and something that you definitely put on a postcard. There is a lot to do there from enjoying one of the (very cold) beaches nearby to having a nice meal or hitting up the art galleries. It’s definitely worth a day trip and is accessible via the commuter rail if you don’t have a car or don’t feel like driving. If you get the chance a trip up there is certainly worth your time, especially when it’s not much more than an hour from Boston.